Search engine poisoning. It isn’t pretty and can be deadly depending on the poison being applied. Though it sounds like we could be talking about the Russian spy and his daughter who were poisoned in the UK last week with an alleged Russian nerve agent, we’re not. 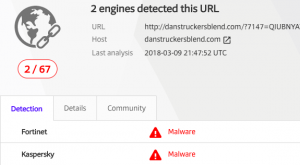 This type of poison shatters our trust in search engines to deliver the information we’ve asked for because we believe search engines have our best interests in mind when they return links in response to our search request. Firstly, we shouldn’t be so naïve. Depending on what you search for, Google is often paid to put responses on the first page of returned links in front of your eyes. Not necessarily because they are the best links to match your search. But paying to put links in front of our eyes isn’t our point here. After all, money makes the world go around. Our point is that Google, and other search engines, can be poisoned. 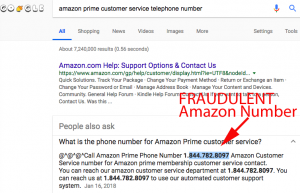 This means they can be manipulated by external forces to pull up links that shouldn’t be there or are not legitimate, such as fake Amazon customer service numbers. 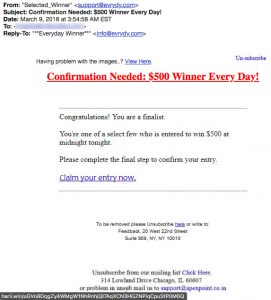 We’ve been writing about this scam since the summer of 2017 and it’s still going strong. 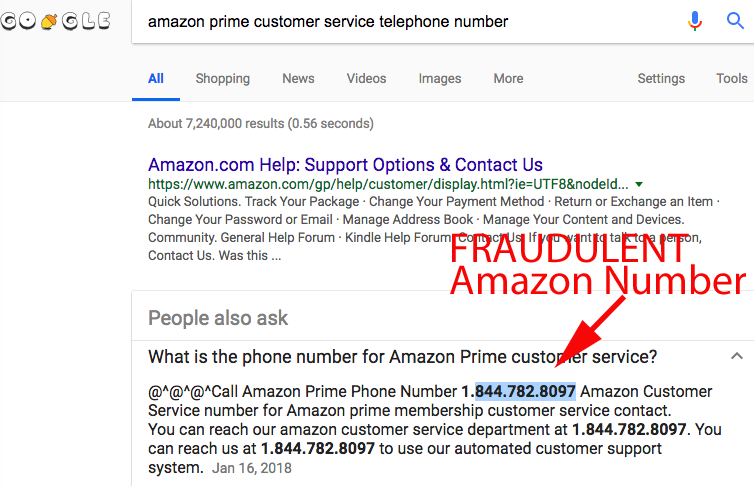 Look what Google returned as the second link a few weeks ago when we searched for “amazon prime customer service telephone number.” That phone number beginning with 844 is a scam number that will cost you dearly should you call them for help. 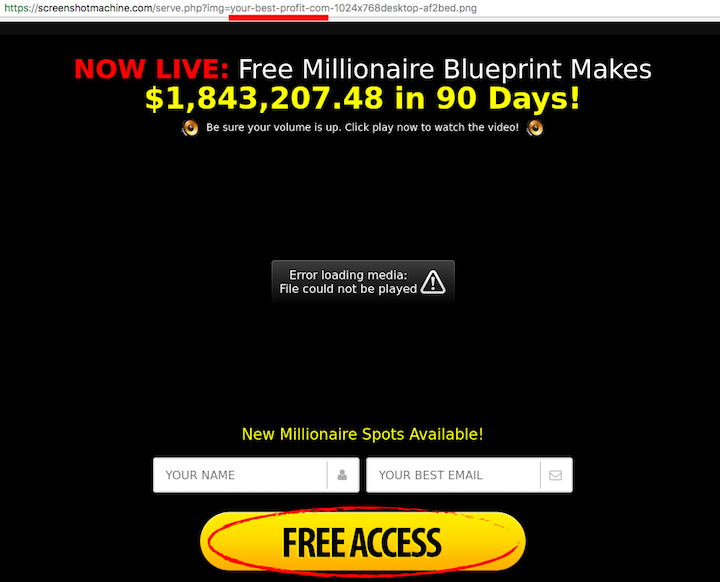 We’ve posted 100 fake phone numbers that have poisoned Google in our article about this fraud. If you want to learn how to identify real from fraudulent phone numbers, read our article. 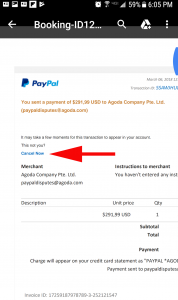 Think you can tell a fraudulent consumer support website from a real one? How about a fake Hulu website? Check out our latest feature article… Deceptive Consumer Services! 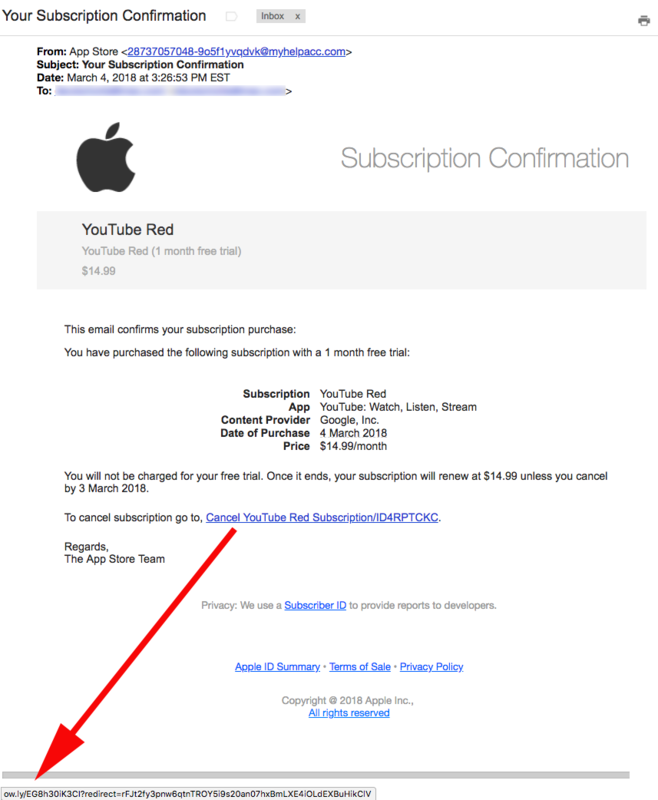 This next email certainly didn’t come from Apple’s app store but it wants you to think it did. 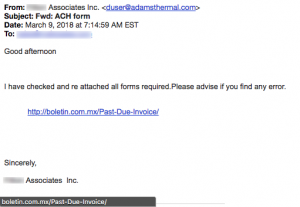 “Your Subscription Confirmation” was sent from myhelpacc-DOT-com. This bogus domain was registered on February 15 through a private proxy service in Canada. 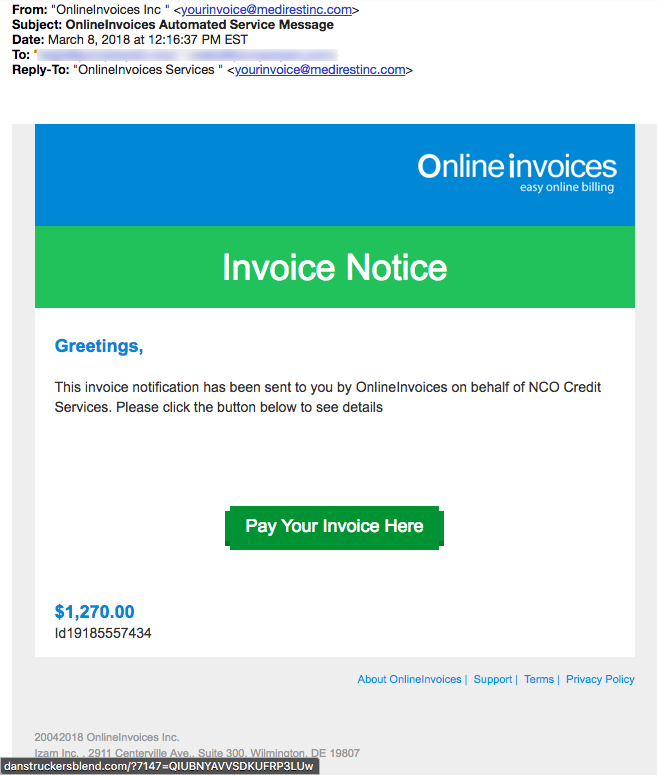 This phish is another social engineering trick. You’re told that you’ve just made a purchase! That’s likely to get a knee-jerk click-response but clicking that link to cancel the YouTube Red Subscription will send you to a phishing site intent on capturing your Apple login credentials. 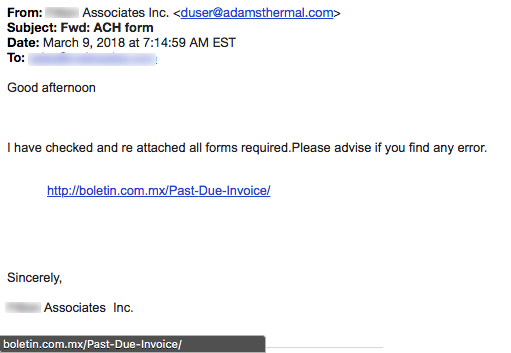 This next phish was screenshot on a phone and sent to us from a TDS reader. 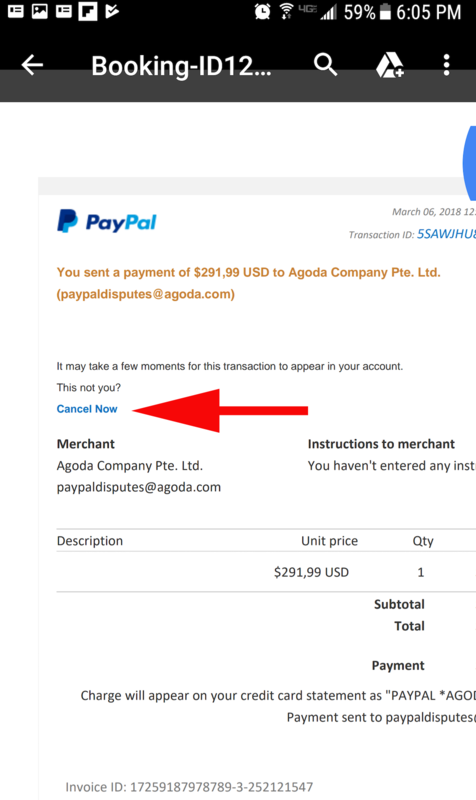 We couldn’t determine exactly where that link “Cancel Now” will send you but our reader doesn’t have a PayPal account and knew it was a phish. Got a suspicious email or text? Send it to spoofs@thedailyscam.com! YOUR MONEY: Invoice Notifications, and Try Your Rosetta Stone Demo for F.r.e.e. 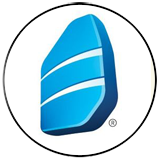 Rosetta Stone is an educational company making software to help people learn another language. 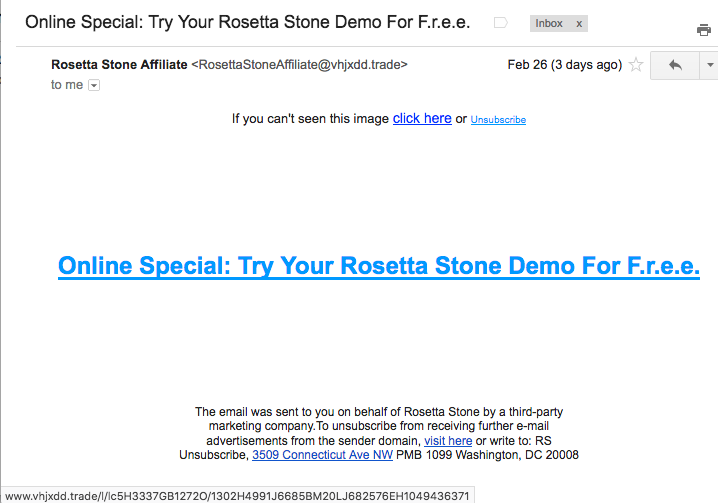 And though this email says that it is from a “Rosetta Stone Affiliate” it is a lie. The oddball domain after the “@” symbol should be a warning to all that it is malicious. However, we can make it even easier for readers to identify this wolf in sheep’s clothing before you open it. 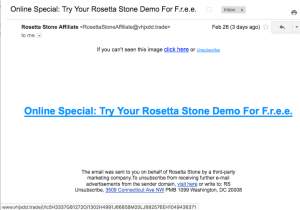 Look at the subject line… “Online Special: Try Your Rosetta Stone Demo For F.r.e.e.” We have seen hundreds of malicious emails that try to fool ant-spam servers who are designed to be suspicious of things marked “free.” Criminals try to avoid this scrutiny by breaking up the word “free” such as f.r.e.e. So, the next time you spot a subject line offering anything for f.r.e.e. Reach for the delete key! Skype is an outstanding service that allows one to video chat with people all over the world. We use it often to stay in touch with friends and family. But what might happen if someone’s Skype account gets hacked and why would a hacker bother? So they can say hello? The answer should be obvious. 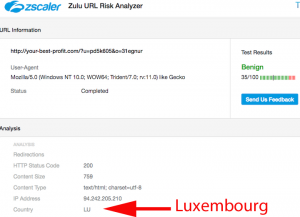 A hacked Skype account becomes another landmine placed at your feet. Stepping on it can lead to a malware computer infection. Doug at TDS has lots of contacts in his Skype account. From a friend’s account last week he found a link that was sent through the Skype text window. 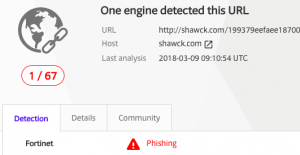 He immediately recognized a shortened link created through Google’s shortening service and, very likely, malicious. 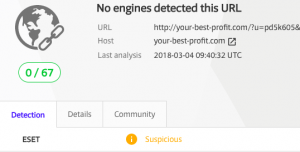 Using Unshorten.It we’ve determined that this short link will redirect him to a website named “your best profit” DOT-com. Hmmmm…. Was his friend trying to tell him about an investment opportunity? 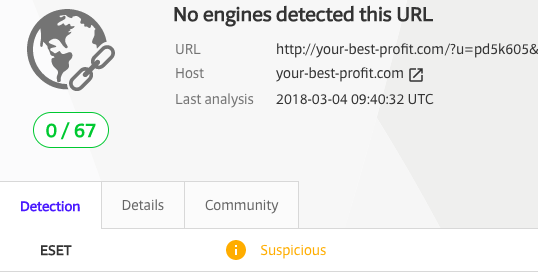 VirusTotal.com found one AV service identifying this website as “suspicious.” The Zulu URL Risk Analyzer didn’t find the website malicious, but with a score of 35, it wasn’t completely innocent either. 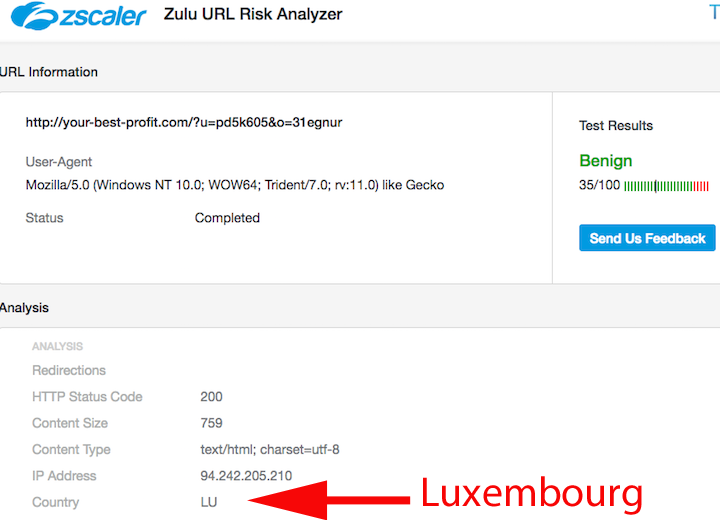 Zulu also found that the website is being hosted in Luxembourg, that small European country sandwiched between Belgium, France and Germany. Any time some anonymous website in a foreign country claims to make you a millionaire, common sense tells us to walk away. 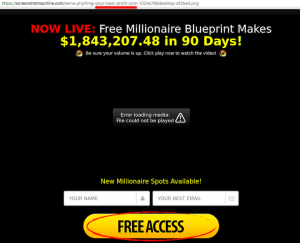 Additionally, we’ve also seen sites like these used as another social engineering trick to have you install malware on your computer so you can “watch the video.” By the way, that domain, your-best-profit-DOT-com? It was registered by “Eleonora” from Mexico City, Mexico on February 22, 2018 just days before Doug received the shortened link. Does any of this inspire confidence to sign up for whatever-this-is? 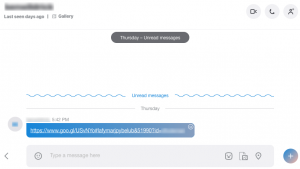 The lesson here is simple, Skype can be weaponized and used against you too. We’ve informed our friend about his hacked Skype account. FOR YOUR SAFETY: ACH Form, I Found Someone You Have to Meet, and You Are A Finalist! We like meeting new people! 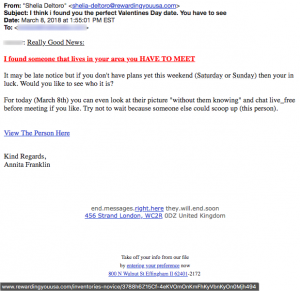 We’ve “met” people from all over the world via our blog, The Daily Scam. From Australia, to Africa to Europe! It’s always interesting and we routinely learn new things from our readers. And so, we were delighted to get this email from Sheila. Or is it from Annita? Not sure. “I found someone that lives in your area YOU HAVE TO MEET.” Wow! That sounds like a strong recommendation! Plus, we didn’t have plans for the weekend so it worked out! We asked “mom” (the Zulu URL Risk Analyzer) if we could go out on a date with this mystery person but mom said no. Malicious! What a surprise. The link for “Claim your entry now” points to the crap domain harii-DOT-win. 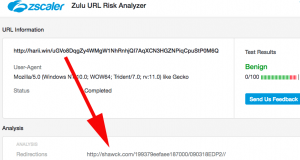 Our “mom” (Zulu URL Risk Analyzer) told us there’s nothing wrong here and we can go out and play. But even Mom can’t know everything! She did inform us that “Harii” made plans for us to meet another website that appears to be “shawcking!” But Virustotal.com doesn’t like it, so we’ll just stay home and watch TV.